"Your course was a godsend. I would not have passed without your help!" " I've just found out the results for my Grade 6 Theory ... I got a Distinction! 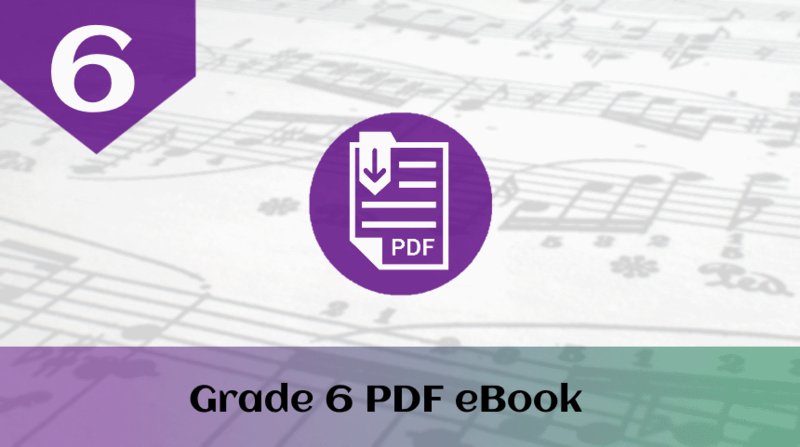 found your easy to understand course incredibly helpful; it allowed me to understand other textbooks and exercises much better"
This course contains everything you need to know about harmony, composition and score-reading, for the ABRSM grade 6 music theory exam. Check out the free preview! (click on "Preview" top right). Each chapter provides a step-by-step explanation of the theory, with lots of musical examples. Each chapter is followed by a series of practice exercises. All answers are provided, model answers are provided for the subjective questions. Suitable for home-study, or for use with your music teacher (age 15-adult). All MyMusicTheory products are gimmick-free and focus on what you need to know and how to learn it. We break tricky concepts down into easy-to-digest steps and give you lots of tips and strategies to help you figure it all out AND remember it. "Your course is excellent...much easier to follow than the big Ottman or Laitz texts. Lighter to carry and easier on the purse." Victoria Williams BA (Music) is a music theory professional who coaches students privately, and publicly via www.mymusictheory.com. A music graduate from the University of Leeds (UK), Victoria specialised in musicology. She also plays the piano and clarinet and composes for pleasure. Victoria coaches students from grade 1 to grade 8 and has an exceptionally high pass rate for her private students. MyMusicTheory.com is the worlds' no.1 website for free, graded, music theory tuition and welcomes more than half a million unique visitors annually.